The absolute most effective method for improving your W-L record is this – study what other winning coaches do, and adapt it to fit your squad. 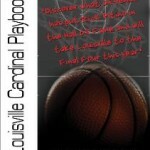 Gain Instant Access to the Master Playbook of Legendary Coach Rick Pitino and Discover, Execute, and Win From the EXACT Plays That’s Helped Him Take Three Different Teams to the Final Four. Plus, You’ll Also Get an Exclusive Zone Offense Scouting Report Containing 13 Different Looks Versus a Zone. That’s exactly why I’ve assembled together some of his most dominant plays across 52 set plays and 124 pages of pure gold. 35 Man Set Plays, 8 Baseline Out of Bounds Plays, 5 Transition Offenses, 1 Zone Offense, 3 Press Offenses. In addition to this, you’re also going to get an exclusive zone offense scouting reports that has 13 different looks versus a zone. Another 31 pages of highly valuable information…..that you simply won’t find anywhere else. Click to buy the 4 eBook bundle for $35.00! You can pay with a Credit Card or Paypal. Throughout the game today coaches from the N.B.A to youth leagues coaches are incorporating the ball screen into their offense. It has become a corner stone for coaches such as Billy Donovan, Bill Self and Brad Stevens. In fact Jeff Van Gundy stated, “If I was a high school coach I would base my entire offense around the ball screen. 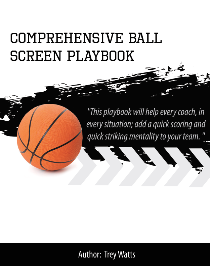 “ This playbook will help every coach, in every situation; add a quick scoring and quick striking mentality to your team. Every type ball screen is covered to expose a coach to the range of options available for adding the ball screen to your offensive arsenal. There are over 12 simple calls that a coach can utilize to counter the various defensive tactics and give a different look each time the ball screen is set. There are over 15 different ball screen drills that will help players master the skills necessary to get the maximum use out of every option on every single ball screen. We have also included 5 different continuity ball screen offenses for coaches that are “all in” with the ball screen the ball screen. We even have a ball screen offense for a coach that wants to play out of a 4 guard alignment. To add even more value for this playbook, we have included over 40 quick hitting plays for a team to use that will flow directly into whatever offensive system your team uses. There are many different ways to try to combat the ball screen. So we have included 8 different counters and calls to help an offense counter actions such as; the defense going under the ball screen, trapping the ball screen, zoning the ball screen, and zoning the ball screen. Learn how Coach Fred Hoiberg turned Iowa State into a nationally ranked offense using NBA spacing and scoring concepts! 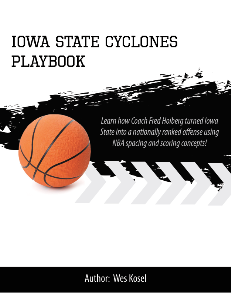 Learn from one of the hottest coaches in college basketball with the Fred Hoiberg Iowa State Cyclones Playbook! The 2013-2014 Iowa State Cyclones finished the season ranked 5th in the nation in points per game (83.0), 11th in total 3-point field goals made, and 1st in assists per game (18.4). The Cyclones won the Big 12 Conference Tournament this season and also made it to the Sweet 16 of the NCAA Tournament. Learn the offensive principles Coach Hoiberg uses to create open shots and penetration opportunities. Hoiberg is big on spacing, and has taken many NBA concepts and formations from his experience as a player in the NBA. The Cyclones are one of the best 3-point shooting teams in the country because of the spacing around the perimeter, spacing on the pick & roll, and spacing on the drive & kick. This playbook includes 82 plays and over 90 pages of material. Get this playbook now and learn from one of the best offensive minds in college basketball! Click to buy the 4 eBook bundle for $35! You can pay with a Credit Card or Paypal. If we do lose, how would I rather lose a late-game lead? How to emphasize the importance of every possession and every situation. There are 130 topics covered in all!